The Level 4 Obesity and Diabetes Certificate is designed to allow you to work closely with clinicians and others within the medical community. 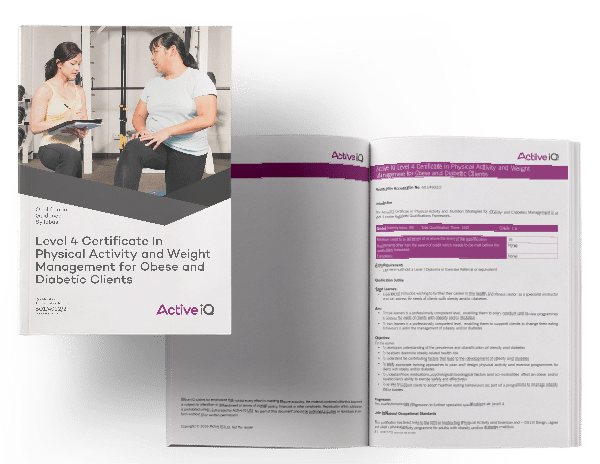 This course trains learners to a professionally competent level, enabling them to plan, conduct and review programmes to address the needs of clients with obesity and/or diabetes. Enabling them to support clients to change their eating behaviours to aid in the management of obesity and/or diabetes. You’ll gain the highly sought-after skills to devise and deliver exercise programmes for those with type 1 or type 2 diabetes, or clinical obesity. The course is also perfectly suited for fitness instructors and personal trainers looking to expand their client base within this growing demographic. Learners must hold a Level 3 Diploma in Exercise Referral or equivalent.